Rows upon rows of charinkos usually found around train stations. Photo courtesy of Tighten up! Generally, parking is aplenty and usually cheap or even free (within certain limits of the law). Just take a look along any street in Tokyo and you are likely to find bicycles parked alongside the pavement. 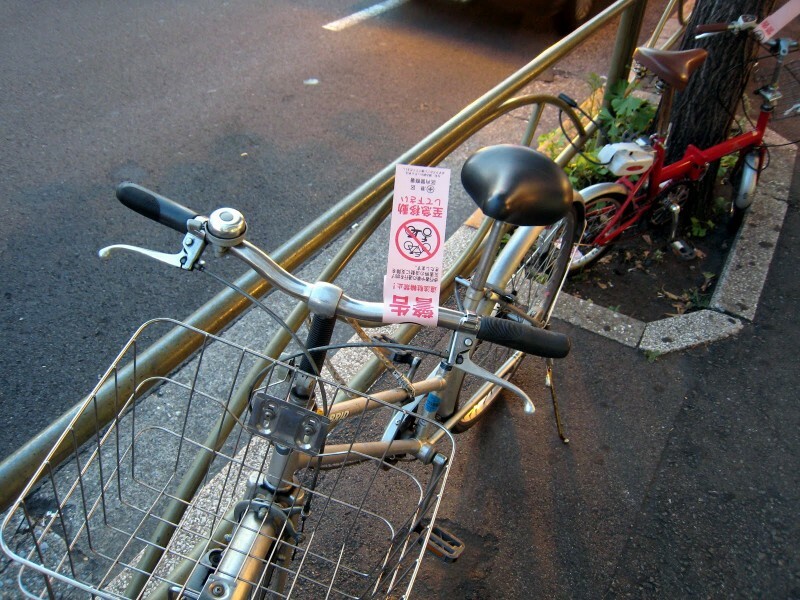 While many bicycles come with built-in locks, Tokyo is a generally safe city and bicycle theft, while not unheard of, is relatively rare. This is aided by the anti-theft registration that owners have to make upon the purchase of a new bike. To top things off, charinkos prices are easy on the wallet. A website to help with finding parking spots. Unlike some other cities in other parts of the world, rules are generally not enforced on cyclists. Helmets are typically found on less than half of cyclists on the road, cycling on the pavement is not illegal. Mothers are often seen with three children on a single bike (one in a carrier, one in a front seat and the remaining child in the back seat) although the legal limit is two. A typical mamachari. Mum + kid + groceries. Photo courtesy of Ignat Gorazd (CC license). The presence of bicycle lanes in some major roads and the presence of multiple parallel alleys makes routing a lot easier. Drivers of other vehicles also seldom make life difficult for cyclists. Did I also mention that central Tokyo is actually a very compact and distances are shorter than they seem? Buses in Tokyo usually have a flat fee structure which makes short trips less worthwhile. Train tickets are relatively costly and taxis are notoriously exorbitant. Cycling quickly becomes an attractive option in light of these points. The medical benefits of regular exercise also sways in favour of cycling. Those who do not wish to purchase their own bikes (tourists, for example) are also able to rent bikes easily. Tourist spots like Odaiba have readily available rental bikes parked in designated parking zones. This is pretty much a MUST and if you find yourself riding a bike that is unregistered… chances are, at some point, a cop would stop you and you would find yourself sitting in a police box for a couple of hours explaining how you got hold of the bike. Plus, if you don’t exactly look Japanese, chances of being stopped by a cop increases several folds. The registration process costs 500 yen and saves you lots of trouble. If you are buying a second-hand bike off craigslist or some auction site, MAKE SURE that you are given the registration papers and the owner signs the form for transfer of ownership. 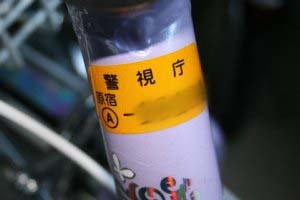 If possible, get the previous owner to go down with you to the nearest bike shop and get the procedure done for 500 yen. More information and form downloads can be found in the following site. If you are a tourist, bring along your passport and contact details of the hotel/shop/owner that you rented/borrowed the bike from. If you do find yourself in a situation where you got hold of a bike (I’m not asking how) but have no access to previous owners… you could consider declaring it as a gift from someone and get one of your friend to fill up this form. The all-important registration seal. Yellow in colour for Tokyo. Parking along the pavements is usually ‘dangerous’ especially if you do so near a major junction or train station. There are signs informing you of areas in which parking is illegal and strictly enforced. 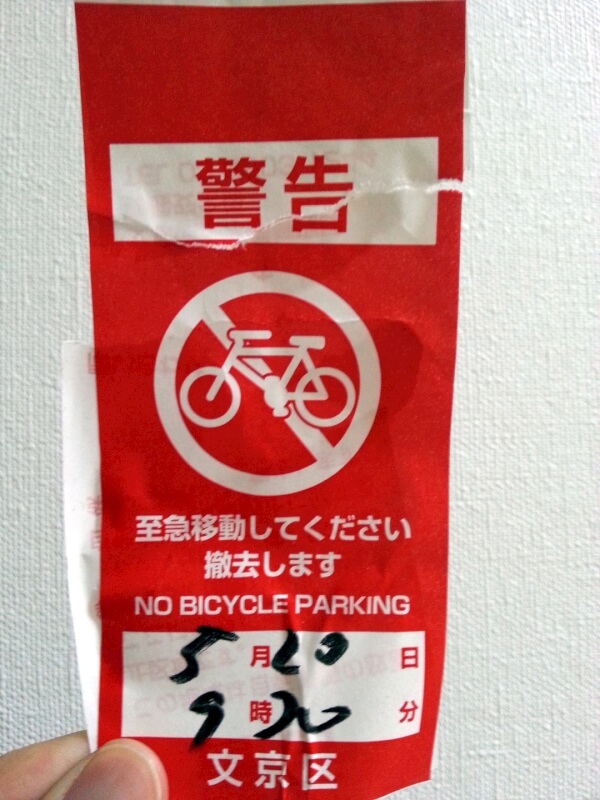 If you are lucky, you would first find a slip of paper stuck to your bike requesting you to move it. If not, your bike might very well be on its way to Saitama in a truck and you would have to spend an afternoon travelling there and paying 5,000 yen to get the authorities to free your bike. (mamachari) portmanteau of ‘mama’ and ‘charinko’. Usually a mother’s bike.